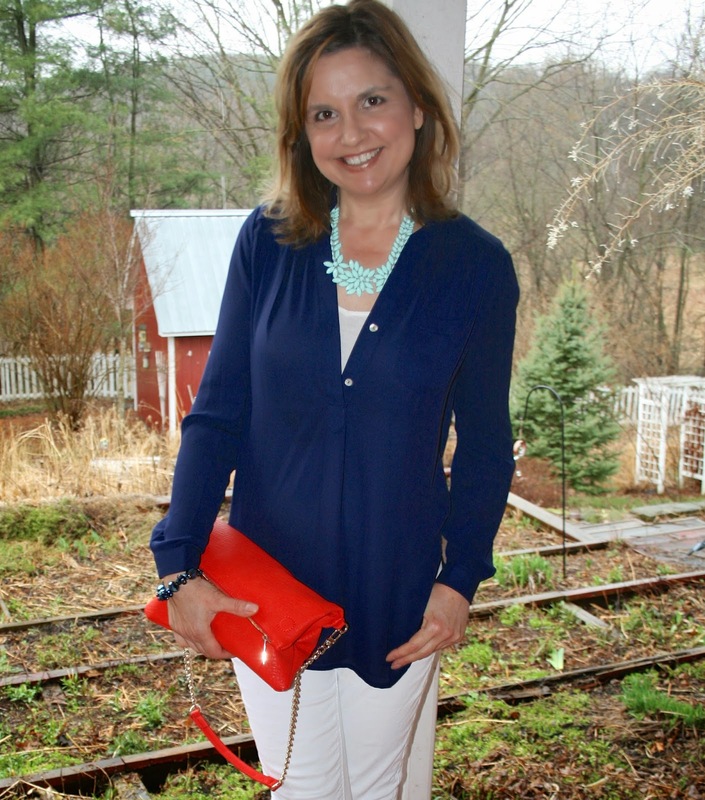 Amy's Creative Pursuits: Fashion Over Fifty: Classics with a Pop of Color! 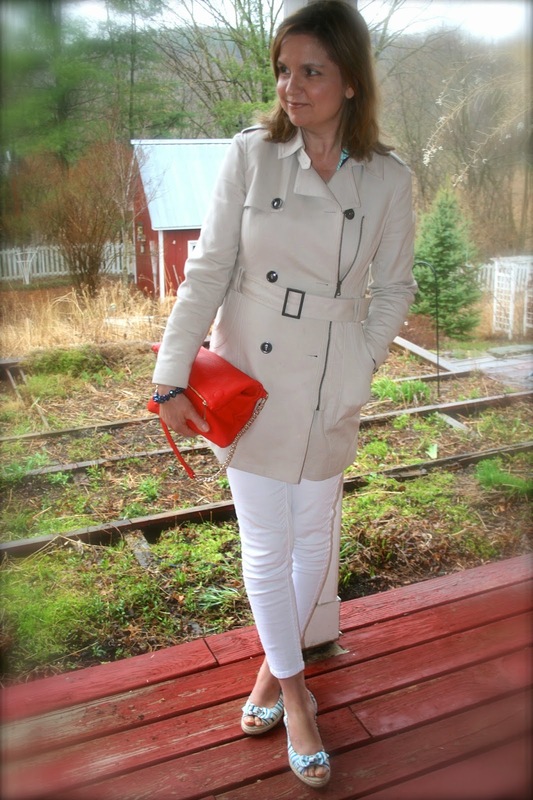 Fashion Over Fifty: Classics with a Pop of Color! Hello! 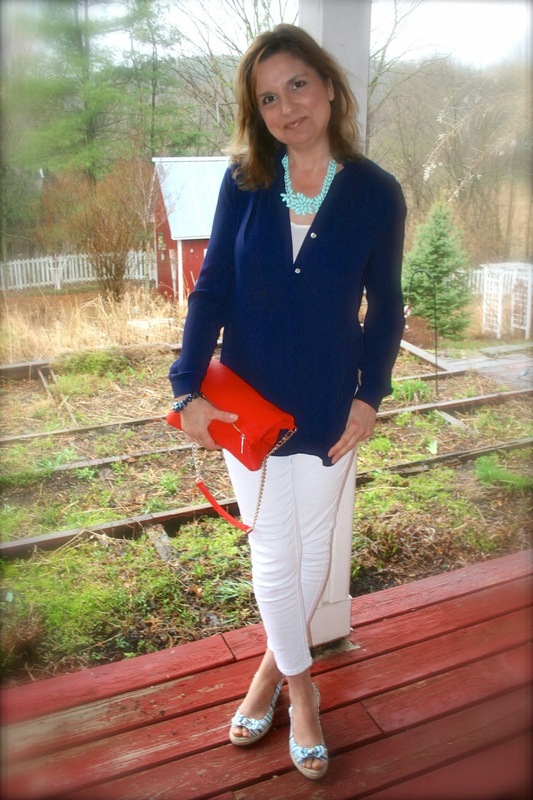 For this week's Fashion Over Fifty post I thought I'd share with you a classic style with some pops of colors added for both fun and interest. 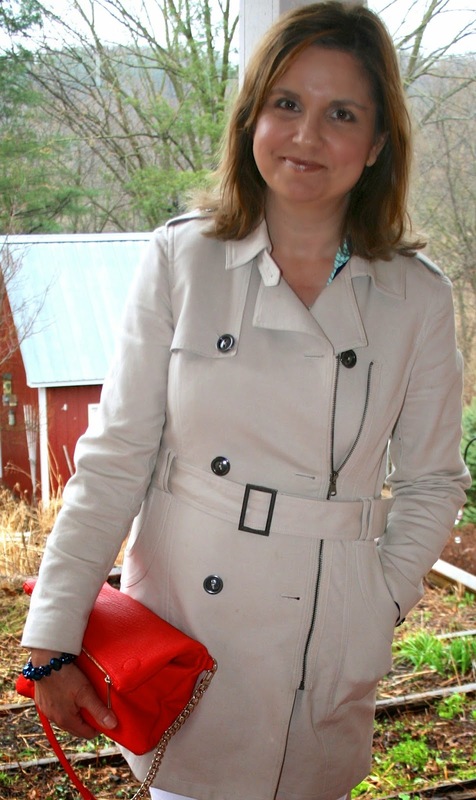 I wore the classic color combo of white and navy, but to make it a bit more trendy, I carried a bold, bright clutch in Tibetan Red (don't you just love that color description?) 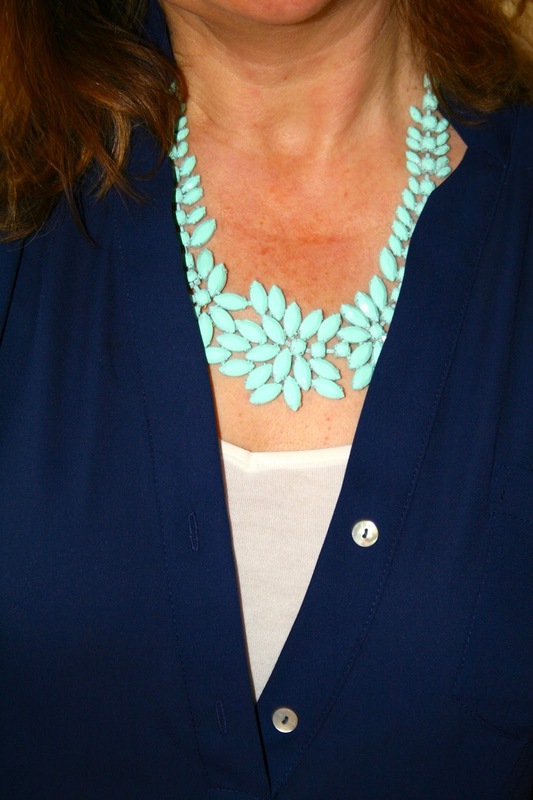 from Express and added a minty teal statement necklace from Francesca's. Because it was yet another chilly, rainy day in northwestern Wisconsin, I wore a classic trench as my outerwear. I bought this coat last year from T.J. Maxx, and because of it's classic style, I'm sure I'll be wearing it for the rest of my life. My white skinny ankle jeans are from A.N.A. My navy pullover tunic is from ModCloth. It is very long, which I love, because it covers everything this fifty year old loves to hide; yet, it is somewhat form fitting in the bust and shoulders so I don't feel like I'm wearing baggy clothes which can make an older woman look frumpy. It is more loosely draped in the stomach area; which is always the area I like to conceal. The material is very sheer, so I recommend wearing a tank underneath. I wore a white tank to match my outfit, but I could see really dressing up this blouse with a sequin or embroidered tank underneath, or even a bold, contrasting color. Here is a close up of my purse. It is larger than most clutches so my big wallet actually fits inside. Normally when I use clutches or cross over body bags I have to change to a smaller wallet, which can be a real pain. My shoes were purchased last year from Famous Footwear. They have a wedge heel and a back strap and the heel has a rope texture to it. And here is a close up of my statement necklace. I love the lighter pop of color it brings to this outfit. Another great outfit. Love how the colors go together! Your classic pieces are so gorgeous and so stylish! I love a great pop of great and your bag is fantastic! great look! i love that trench! its fantastic and a perfect staple for any closet! great picks! Lovely outfit, especially like the jacket and the shoes! Looking good Amy!